When I discovered that one of my favorite Directors/Producers, Francis Ford Coppola, owned a collection of boutique hotels and one of them happened to be in Buenos Aires, I knew that my Argentinean husband and I had to stay there on our next trip to the “Paris of the South”. It was immediately obvious upon arrival that Mr. Coppola’s touch was everywhere. Our room was even named after him! Jardin Escondido is located in Palermo Soho, one of the most trendy neighborhoods in the city, which also happens to be my favorite as well. 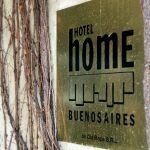 The hotel’s English translation is “Hidden Garden” and it definitely lives up to its namesake, as it is a calm sanctuary amidst the hustle and bustle of Buenos Aires. Within walking distance from this oasis are boutiques, restaurants, bars, and an abundance of street culture just waiting to be taken all in. The Francis room is stylishly cozy. It is decorated with rich Argentine furnishings and I felt as though I was at home and not a tourist in a foreign hotel. It has a queen sized bed and the room opens up to a spacious terrace that overlooks the property’s pool. 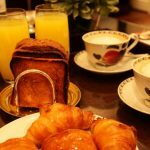 A full-time housekeeper and an English-speaking concierge is always available to meet your needs. The ensuite bathroom perfectly compliments the room and the bathtub was a welcoming retreat after walking for hours upon hours in the city. The hotel has three levels of gardens, a solar-heated pool, and an outdoor kitchen and grill. It also has private meeting rooms, as well as a public living room with an impressive accumlation of films and books for guests to use whenever they please. In case you are in need of some coffee there is an Illy caffe machine, however if you are in need of some wine there is an on-call sommelier who is passionate about helping you discover your favorite wine/s. Mr. Coppola himself produces an incredible collection of wines. To be staying in a stunningly beautiful colonial villa that was home to one of the Hollywood greats was a thrilling feeling. I loved sitting on my terrace, drinking a café con leche, and daydreaming about Coppola once living here. It is quite easy to see how his surroundings inspired him. I wish I had known about it sooner as well! Wow, that place looks way cool! Where did the suitcases come from? It was sooo cool! The vintage suitcases were already in the room as decoration. This place really was gorgeous. And I’m excited for the Buenos Aires posts to start! I am so so so so happy that we got to spend some time together in BA! You were the best part about that trip. mmm… cafe con leche. Muy rico! And an on-call sommelier? Heaven! Andi’s picks are Traveling Ted’s want to visits. Wow, what a cool place! Yes, we had the best time! Love it! LOVE that pool. I wish it had been warm enough for us to swim in! I am trying to send you an email about a Charlotte area event I think you will be interested in. I clicked the email link but it was empty! Not many writers impress me with their informative articles, but you have done it. This is great work and very interesting content. Thanks for posting! Wow! What a charming place. Love the room! Charming is the best way to describe it! It really is a special place! You’re welcome!!! Wow, now that is a cool hotel! Wow this place seems like the coolest hotel in the world! Wow definitely putting this on the Bucket List! I stayed here last year due to your recommendation and I must say you were 100% right! This place was incredible!! !